Spectrum Addict LOAD "FILM 2"
Santa brought me a ZX Spectrum 48K Christmas 1984. My Aunty Ann gave me ten whole pounds, with which I purchased Knight Lore, and within weeks my paper round money and (shh, dinner money – I survived on crisp sandwiches) meant I could buy one full price game a week. I lived the Spectrum. I breathed the Spectrum. It was in my blood and in my soul. I was addicted! 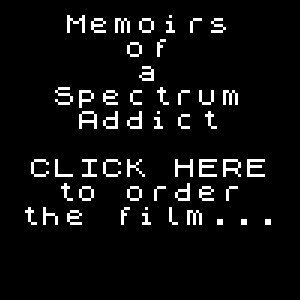 The first film, Memoirs of a Spectrum Addict, met with critical acclaim and lots of nice people said nice things about it, like Retro Gamer Magazine who awarded it Pick of the Month and said, “There’s a heart and personality to Memoirs which is missing from many of its peers” and “It’s a delightful labour of love”. Please take the time to drop by the LOAD “FILM 2” Kickstarter campaign and see what it’s all about. I’m thrilled to announce (if you haven’t already seen it!) that Memoirs of a Spectrum Addict received “Pick of the Month” in Retro Gamer Magazine, Load 172 (Sep2017). Thank you to Darran Jones and the Retrobate Team for their amazing support of the film. 🙂 Go check it out! You can buy the film from… www.remicmedia.com/speccyaddict (prices have been lowered since Retro Gamer went to press). Had a great time meeting and interviewing Jim Bagley, of Cabal and Midnight Resistance fame. The first meeting was at Play Expo in Blackpool, where Jim – bless him – was exhausted from his motorbike and Play Expo adventures (he was Guest of Honour). We still had a great chat about some of the things to be covered in the interview.